And here we are again exploring a new cooler brand. We’re always giddy and excited when we’re looking at a new cooler brand, wanting to know everything we can about it. Today we’re going to be doing a Tourit Cooler Review. Now, there are things we know about this brand, and there are things we don’t know about this brand. 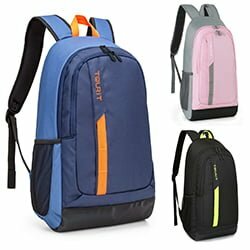 We know that they have some cool backpack coolers with a ton of variety, both in terms of design and colours. We also know that they have high-quality soft coolers, with pretty good ice retention. What we don’t know is who is behind the company, when it was founded, and where it is based. Their website is pretty silent about such matters, and we couldn’t find much, even when we dug deep into their blog. However, that said, they have some pretty cool products, and we won’t begrudge them a review simply because they want to be mysterious about their identity. Maybe we can think of them as the Batman of the cooler world; the masked vigilante that delivers great soft coolers to the market and wants us to focus on the product, rather than the person behind the product. 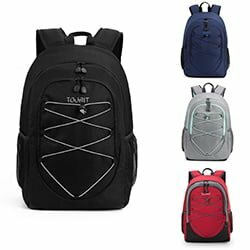 One of the things we love about the Tourit line of products is their design. 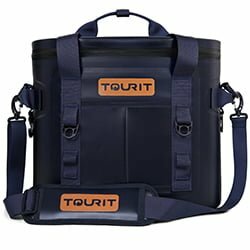 These guys go the extra mile to design their Tourit soft cooler to look sleek, modern, and basically like something you wouldn’t just use to cool your drinks and food, but would also be very proud to show off to your friends and family. 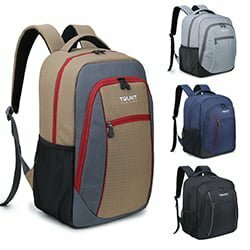 I know I wouldn’t mind being spotted carrying a Tourit soft cooler. Something about it screams “class.” If you think about it, that’s what they were going for anyway, seeing as they advertise themselves as a premium brand. 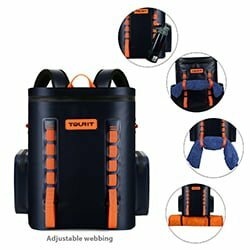 The construction of the Tourit soft cooler, no matter which one you’re going for, is pretty solid. 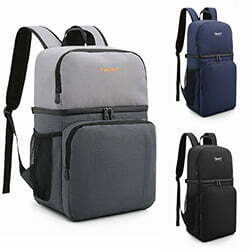 The material is leak proof, and the soft cooler itself has been designed in such a way that it is resistant to impact. The shell is waterproof and pretty tough. This is a key feature in any premium soft cooler that you know you’re going to subject to outdoor conditions. The last thing you want is an outer shell that’s easily going to tear and come apart. That means your interior insulation is compromised and now you can’t keep your stuff cool. 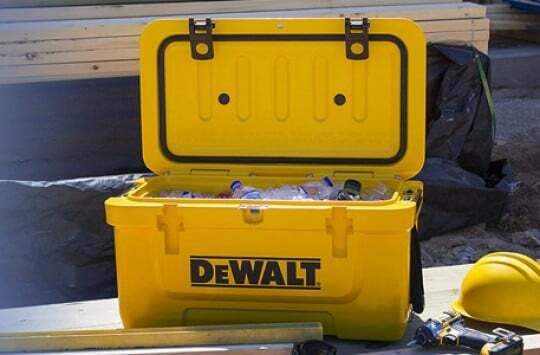 Speaking of interiors, the interior of this cooler is built to prevent all forms of sweat. The liner is antimicrobial and highly resistant to mildew and mold. It’s also pretty easy to clean. To clear everything up, you have an airtight zipper that’s easy to pull via the pull tab. Zip it all up, and you have a soft cooler that’s completely leak proof. Nice. With a soft cooler, comfort is key. 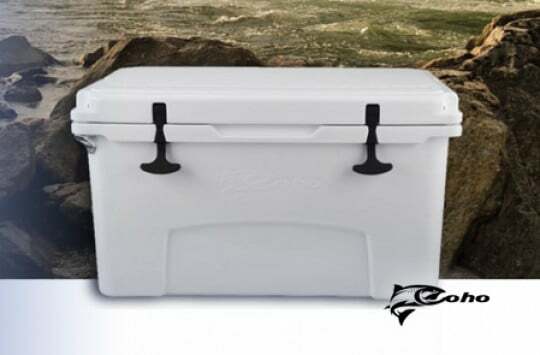 You want a cooler that you can carry and feel comfortable carrying. 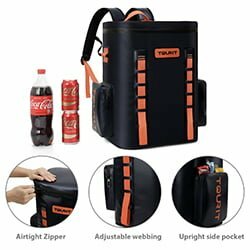 Now, seeing as people prefer to carry their stuff in different ways, a good cooler should offer different options for carrying as well. You should have an option to carry it from the shoulders, or the sides, or the top. As it turns out, the Tourit soft sided cooler has just these 3 methods for carrying. 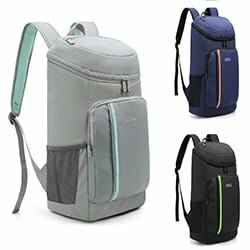 There is a detachable shoulder strap for those who want to carry their cooler like a backpack (although if you’re really into backpack coolers, you can just get the Voyager Backpack Cooler. ), then there are the top handles which allow you to carry your cooler from the top, and also the side handles. The shoulder strap is best for when you’re dealing with a light to medium load. However, when you have an especially heavy load, it’s a better idea to go for the top or side handles. And now we look at the design of the insulation. We are talking about a cooler, after all. The cooling performance is actually pretty good based on the insulation design. There are 3 layers of insulation. The outer layer is waterproof and is mainly there to prevent sweat. The interior is another leak-proof layer to ensure no moisture finds its way out. With all of those layers, the ice retention period for this cooler is 3 days, which we believe is pretty cool. 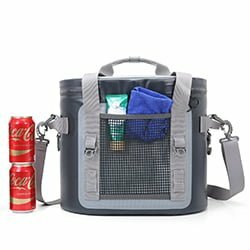 Another thing we like about this cooler is that the dimensions are unisex, which means it can be used and carried by both genders. 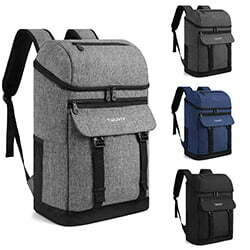 It also has a wide mouth for easy accessibility and plenty of storage space in the form of a zippered pocket in the front and mesh pockets in the sides. They come in navy blue and cool grey. They also come with a 3-year warranty. 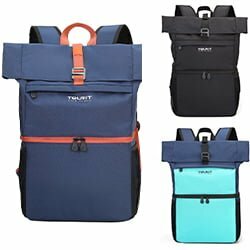 We don’t review a lot, but since it’s still in our niche, we won’t pass up the opportunity to review a good Tourit Cooler Backpack when we come across one. 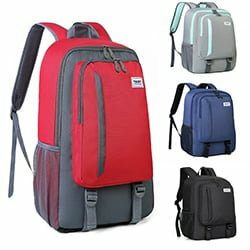 In this case, we didn’t just come across a good backpack cooler; we came across a whole line of them! Let’s start with how tough the shells are on these backpacks. The shell is 600 denier Oxford, making it pretty tough. On the inside, we have EPE foam and heat-welded PEVA. Together they make for a strong and long lasting product. As usual, the outer shell is fully leak proof and sweat proof. The inner insulation consists of high-density foam and leak-proof liner. Together they work to keep your drinks cold, just the way you like them. If what you’re looking for is variety, then you have arrived at the home of variety. We now get to that part of the review where we take the incumbent and compare them to the industry giant. Wouldn’t it be cool if we did it as they do it in boxing tournaments or wrestling matches? “And on this side, we have the new kid on the block; Mr. Tourit himself! Okay, let’s be serious now that was enough fun. 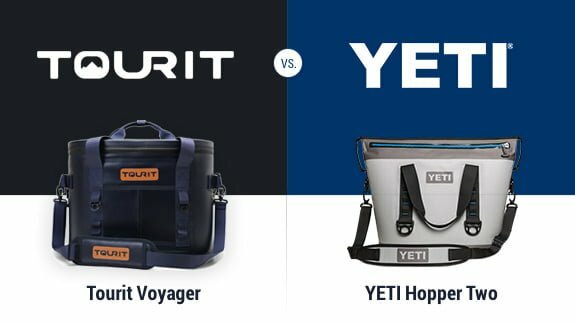 So we have the Yeti Hopper and the Tourit soft cooler. What can we compare? 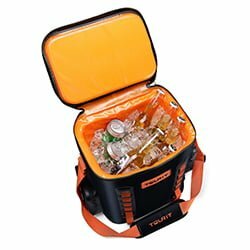 We know that the Yeti Hopper is an industry leader known for having great design, great usability, and ice retention that’s pretty hard to beat. On the other hand, it is very expensive. 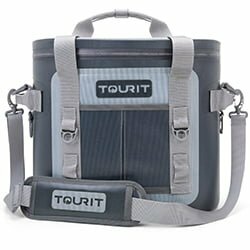 The Tourit soft cooler is another soft cooler with some pretty cool designs, great usability, and some really good ice retention. While it isn’t necessarily cheap, it certainly is cheaper than the Yeti Hopper. The one thing we think the Tourit Cooler legitimately beats the Yeti Hopper at is the design. Sure, that’s a bit subjective but we think this cooler has some great designs and plenty in the way of variety. 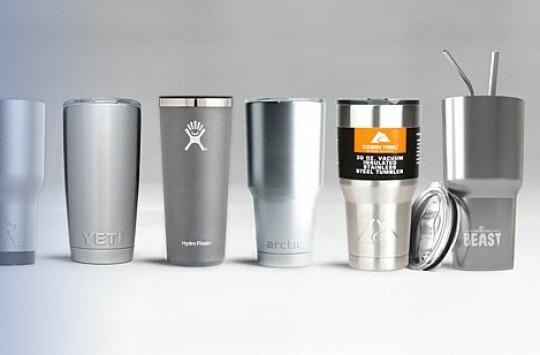 While Yeti has lots of variety as well, we are proud to say we’ve actually found a brand that beats them. The Yeti Hopper is still superior regarding ice retention, however, with ice retention times that are still industry records. Ultimately, Yeti is Yeti. They are the industry giants, and it is hard to unseat them. If you have the money to buy a Yeti and happen to be a fan of theirs, then get yourself a Hopper. 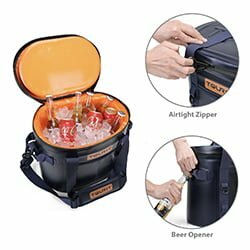 However, if you have just a little less, but still want a premium cooler that could rival Yeti, and you are willing to try out something new, then get yourself a Tourit. 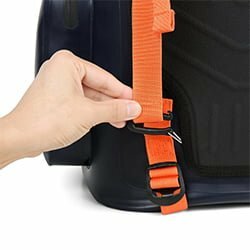 While the Tourit is a great premium soft cooler, there are some pretty cool alternatives out there which happen to be cheaper. We have reviewed them before so you can click on the link to read a more in-depth review of them. 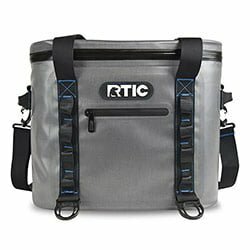 RTIC coolers are pretty cool, and they have sleek designs that could rival Tourit and Yeti. We love the fact that RTIC has a solid reputation for making quality products and happens to offer them at an affordable price. Read our RTIC SoftPack review here or get it on Amazon here..
Pelican has a solid reputation, having been around for many years. 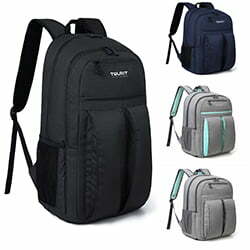 This brand is well known for making top quality products, not just coolers but other products as well. 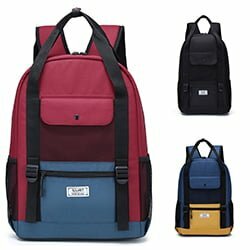 Their soft coolers are really good quality when it comes to the functional aspects, but we feel they could do better on design. However, if you only care about the functional aspects, then this is an excellent cooler to try out. 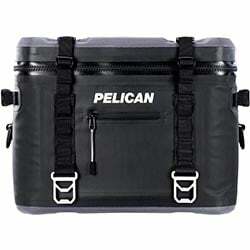 Read our Pelican Soft Cooler review here or get it on Amazon here. 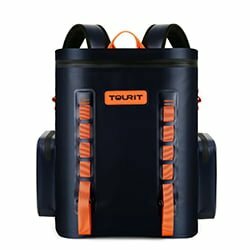 You can buy Tourit soft coolers on the company website as well as at lots of online stores. 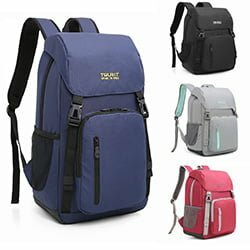 However, we recommend that you get Tourit soft coolers on Amazon because it is the most trusted online marketplace in the world. You get to read real reviews by other customers, you get perks like free deliveries in some circumstances, and you also get buyer protection where you get a full refund if you don’t like the product and return it. And that ends our Tourit cooler review. So are you looking for a product adventure? Well, it doesn’t get any more adventurous than this. Tourit coolers are a great brand, and we see a bright horizon for them.